Of course, we don't really have any dark Mondays during Summer Fest! 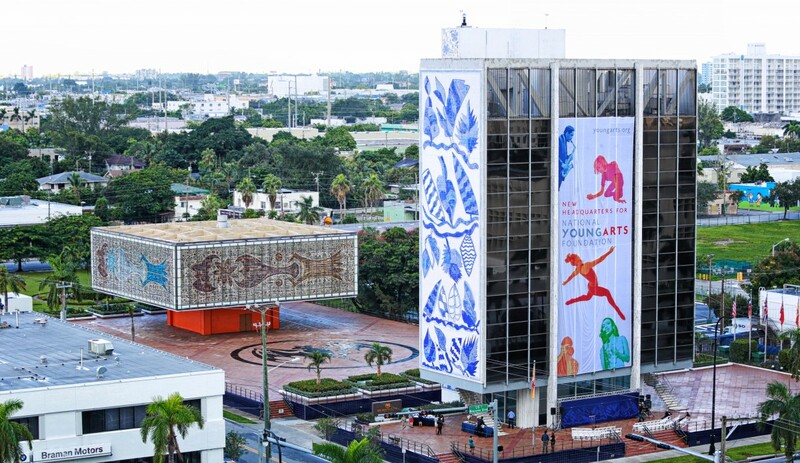 Tonight, you can attend a reading of Juan C. Sanchez' Buck Fever at the Young Arts Miami Campus, part of South Florida Theatre League's new play reading series. If you're looking to Get In Bed With The Arts, you'll have your opportunity this Thursday at The Plaza Theatre, where you can also slip in to enjoy 8 Track: The Sounds of the 70's. And you still have a chance to enjoy a free night of theater in July - but you'll have to sign up soon. Now here's your Monday reading list. The Shiny Sheet reports that The Society of Four Arts in Palm Beach has launched a Tuesday play reading series, starting off with "an excursion into the works of Neil Simon." So who's reading these "works?" Cook selects about four scenes from each play to be read during the session. Attendees aren’t required to read. “Everyone needs an audience,” she said. Well, it's not like you need impeccable timing to do justice to Simon's comedic pacing. Florida Theater On Stage fills us in on this year's iteration of Girl Play, a series of readings staged by The Women's Theatre Project. Girl Play is comprised of three programs featuring readings of 16 short plays with lesbian themes, by straight and lesbian playwrights. The scripts were chosen from a field of 110 submissions from the United States, Canada, England and Australia and underwent two sessions of evaluations. Palm Beach ArtsPaper talks with Marilyn Wick, who is taking over the home of the late Caldwell Theatre Company to create The Wick Theatre & Costume Museum. Wick is the owner of Costume World, which has the largest inventory of theatrical costumes in North America. And she's not shy about her business plan. First of all, we do not intend to screw things up with a theater. Don’t you be thinking that for one minute. ...the idea that every theater is constantly broke is a myth. Lots of them are making money and they’re making it correctly. You have to know your market and you have to know what people want. It’s just like being in the costume business. You’d better know what’s hot this year, and that’s what you put in the stores to sell. The same goes for theater. What’s hot and current will move and sell. Time will tell if expertise in renting costumes on a national scale equates to understanding programming on a local scale. Florida Theater On Stage reports that the Tamarac Theatre of the Performing Arts, a company that opened as the Ann White Theatre, and was also known as the White-Willis Theater, has been evicted from their space at the Tamarac Square West Shopping Center. The reasons are not financial; their landlord apparently has a new vision for his shopping plaza that doesn't included a theatre company. The Palm Beach Daily News reports that The National Arts Institute could sign a lease for the Royal Poinciana Playhouse sometime in the next month. Both Florida Theater On Stage and The Drama Queen are talking about the line-up next season at GableStage. It includes the Tony-Award-winning Vanya and Sonia and Masha and Spike by Christopher Durang, the off-Broadway hit My Name Is Asher Lev, and South Florida's Tarrel Alvin McRaney's adaptation of Anthony and Cleopatra. ...when the region's leading theatre critic is looking forward to your show. At least, The Drama Queensounds enthusiastic as she tells us about Slow Burn Theatre Company's upcoming production of The Wedding Singer. 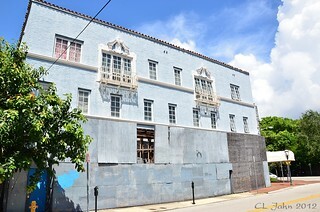 ...in Coconut Grove, Miami New Times suggests that the State of Florida has apparently come up with a plan to deal with the fabled Coconut Grove Playhouse: demolition by neglect. 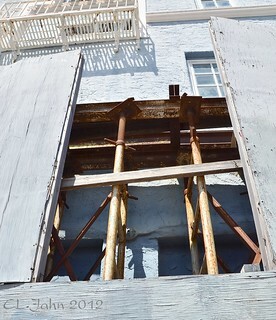 (Vicki F Thompson, program administrator for the environmental protection department's Division of State Lands)... says the department is working on hiring local contractors to replace and paint the plywood that covers the windows and doors to the Playhouse, as well as fix the fence and cover up graffiti on the exterior walls. We will only point out that paint won't shore up the crumbling walls. In case you didn't notice that the plywood on the south side of the building is covering up BRACES. This is not scaffolding, these are jacks. They are holding up steel i-beams that are holding up the wall of the theatre.